After two weeks of what could charitably be called disappointing box office for new films, here's Memorial Day Weekend, which should finally bring the film that will dethrone The Avengers. Even if that does happen, it's more out of a sense of inevitability rather than the new champ being something we're all excited about. June can't get here fast enough. Once upon a time, Will Smith was the unquestioned ruler of the summer season, although this period was shorter than everyone remembers. We also know it was quite a while ago, since it also overlapped with the period when Jeff Goldblum was considered a big box office draw. 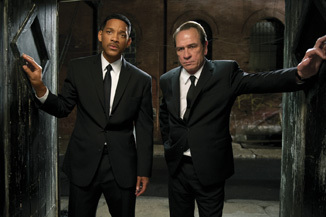 But with Independence Day and Men in Black, Smith launched from being “the Fresh Prince guy” to a legitimate movie star. That success bred a little bit of arrogance, and led to things like Wild Wild West and Men in Black II – awful, unfunny, unpleasant films that sent him scurrying a little. After regrouping with some dramatic roles, one that earned him an Oscar nomination, and a couple of moody action films (I Am Legend and Hancock), he's actually been absent from the big screen for almost four years, from the release of Seven Pounds until now, with Men in Black III. The “ten years later” sequel is usually a bit of a desperation move for someone in the cast, and in this case it looks like more of one for Barry Sonnenfeld than anyone else. Although he's worked consistently in TV over the last decade, Men in Black II was sort of the final straw for him as a big budget director (he had a bit of a hiccup with RV, which one imagines was already in the works before the MIB II flop). This third film once again undoes all the closure of all the rest of the series by having Smith's Agent J travel back in time to stop a plot to kill Agent K (Tommy Lee Jones in the present, Josh Brolin in a seemingly dead-on impersonation back in the 1960s), which would be a prelude to an alien takeover of Earth somehow.